Here could be a good way to convert last night's leftover rice into a healthy breakfast! 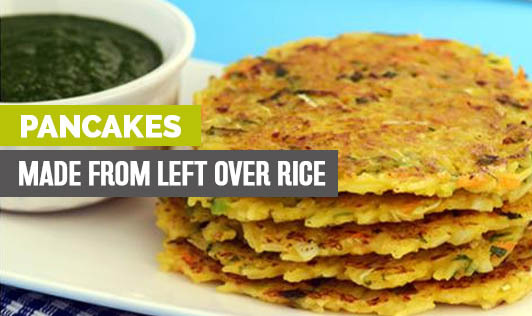 These rice pancakes are made with a batter of left over riceand besan. The addition of veggies brings in crunch alongside the nutrients. This Indian relish makes your breakfast filling and delicious. • Mix all the ingredients in a bowl. Using enough water, mix the batter to dropping consistency. • Heat a non-stick pan and spread little oil on it. • Pour a ladleful of the batter on the pan and unfold in a circular motion to create a (4") diameter circle. • Cook until it turns golden brown in color on either side. • Serve hot with pudhina chutney or tomato sauce.